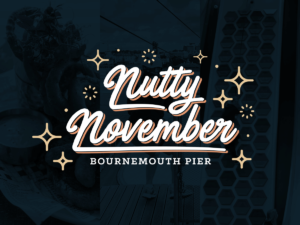 31 Oct Nutty November-Half Price Offers! HALF PRICE OFFERS FOR LOCALS DURING NOVEMBER ON BOURNEMOUTH PIER! This year by popular demand we are bringing back half price offers for locals during the month of November. 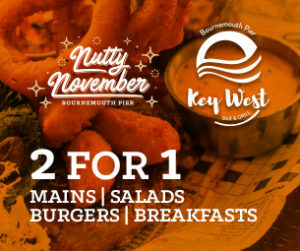 As the nuts begin to fall, so does the price of some of our activities at ROCKREEF UK and a selection of meals at KEY WEST BAR & GRILL! We know as locals the Bournemouth Pier can be crowded so we would like to invite you down this winter to enjoy the very best of what Bournemouth Pier has to offer at HALF PRICE! If yes, you are classed as a local! – Time to enjoy Half Price offers! 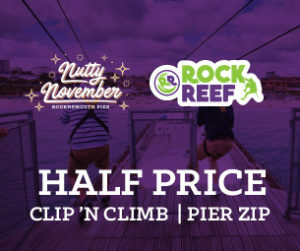 RockReef is a all year, all weather, activity attraction on Bournemouth Pier. RockReef features a whole host of fun for all ages from 4- 94! With the main indoor activity being Clip ‘n Climb which has 28 climbing walls of varying difficulties, plus the very challenging Stairway to Heaven. The Bournemouth Pier also hosts the “Worlds first pier to shore zip wire” known as the ever so popular PierZip! We hope you are a thrill seeker as the PierZip is the ultimate experience. Get ready as you will need to climb the Zip Tower 60 feet above the sea and launch off into your flight and “Zip-Surf” 250 meters over the waves to the shore! Please book in advance as sessions will sell out. Key West is a relaxed Bar & Grill located 200 meters out to sea at the end of the iconic Bournemouth Pier. Key West provides you with stunning panoramic views of the bay that will take your breath away. Enjoy a varied, great tasting menu from traditional Fish & Chips to the tasty Spiced Fish Noodles served with mussels, prawns and grilled fillet of cod. – Proof of address may be requested at RockReef, PierZip or Key West. One proof of address allows entry for up to 4 people, this can include a drivers licence or utility bill. – The RockReef/PierZip offer is valid for sessions between 1st-30th November inclusive. – The Key West offer is valid for purchases in Key West between 1st-30th November inclusive, subject to availability. When ordering 2 items included in the offer, the cheapest one will be FREE. – These offers are not valid in conjunction with any other discounts or events, including group bookings, parties & RockStars. – To receive discount, please use the codes and quotes provided above.